SANAA- Yemen’s Houthi movement launched a ballistic missile deep into Saudi Arabia and may have also fired on a U.S. warship, two days after an apparent Saudi-led air strike killed 140 mourners at a funeral attended by powerful tribal leaders. Saturday’s air strike ripped through a wake attended by some of the country’s top political and security officials, outraging Yemeni society and potentially galvanizing powerful tribes to join the Houthis in opposing a Saudi-backed exiled government. On Monday, a Saudi-led coalition waging war in Yemen said it had intercepted a missile fired by the Houthis at a military base in Taif in central Saudi Arabia, striking deeper then ever before in the latest in a series of more than a dozen missile attacks. A missile was also fired at Marib in central Yemen, a base for pro-government militiamen and troops who have struggled to advance on the Houthi-controlled capital Sanaa. A U.S. military spokesman said two missiles were fired from Houthi-held territory at the USS Mason, a guided missile destroyer sailing north of the strategic Bab al-Mandab strait. Neither missile hit the ship. The Houthis denied firing at the U.S. ship. Riyadh is leading a coalition of Arab states which began launching air strikes in Yemen 18 months ago to restore to power ousted President Abd Rabbu Mansour al-Hadi, who was driven from the capital two years ago by the Houthis. The Houthis, fighters from a Shi’ite sect that ruled a thousand-year kingdom in northern Yemen until 1962, are allied to Hadi’s predecessor Ali Abdullah Saleh. 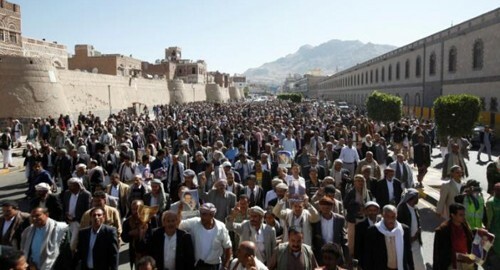 They have the support of many army units and control most of the north including the capital Sanaa. The war has killed at least 10,000 people and brought parts of Yemen, by far the poorest country in the Arabian peninsula, to the brink of starvation. Both sides accuse the other of war crimes. The Saudis say the Houthis are stooges of their enemy Iran. The Houthis say they have led a national revolt against a corrupt government, and the country is now being punished by its rich and aggressive Gulf Arab neighbors with U.S. political and military support. Riyadh has denied responsibility for Saturday’s air strike. Iran’s Foreign Minister Mohammad Javad Zarif said on Monday Saudi Arabia should be held accountable for war crimes in Yemen. “Not only Saudi Arabia, but also those who have supported the aggression by the Saudi-led coalition against Yemeni people should be held accountable for the war crimes perpetrated in Yemen over the past year and a half,” Zarif was quoted as saying by Iranian state-funded Press TV on Monday in a letter to UN Secretary General Ban Ki-moon. Zarif also called on Ban to facilitate Iran sending a plane carrying humanitarian aides to Sanaa. Saudi Arabia and its Gulf Arab allies have launched thousands of air strikes against the Houthis and have imposed a naval blockade that has restricted access to imports for a country that depends on buying food abroad to feed itself. This month the Houthis launched a missile at a ship from the United Arab Emirates and at government positions on a island at the strategic 20 km (12 mile)-wide Bab al-Mandab strait, which controls the mouth of the Red Sea, on the main shipping route from the Indian Ocean to Europe through the Suez Canal. Among the dead in the funeral bombing on Saturday were notables straddling the country’s many political divides, threatening to harden the will of powerful armed tribes around the capital who may make common cause with the Houthis. “Despite all the massacres that have happened in this war, attacking a funeral is unprecedented and crosses a major red line in Yemeni culture,” said Farea al-Muslimi, an analyst at the Sanaa Centre for Strategic studies.